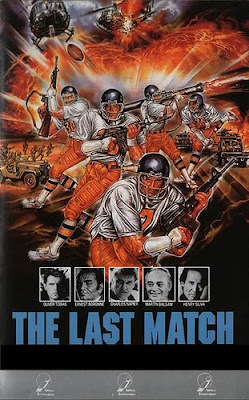 In a perfect world, THE LAST MATCH would be an integral part of the Super Bowl pre-game show, an ideal time to annually visit one of the all-time dumbest action movies ever barely released to an ambivalent public. Made at the end of the '80s Italian action cycle and, as far as I can tell, never released in the US, not even on video (IMDb credits Vidmark Entertainment, and the above art--not only showcasing '70s-style "faces in boxes" but also head shots of the actors that actually appear to be from the '70s--has the Imperial Entertainment logo, but neither ended up actually releasing it), this hilariously awful actioner from director/head coach Fabrizio De Angelis (utilizing his trusty "Larry Ludman" alias seen on such 1980s video store mainstays as the THUNDER WARRIOR trilogy, DEADLY IMPACT and the KARATE KID ripoff KARATE WARRIOR), with input from offensive coordinator Gianfranco Clerici and special teams coach Vincenzo Mannino, fails to execute its howler of a game plan, drawing multiple flags for sheer idiocy. Pro football quarterback Cliff Gaylor (Oliver Tobias) calls an audible (OK, I'll stop) when his daughter Jenny (Melissa Palmisano) is falsely accused of drug smuggling and thrown in prison while vacationing in an unnamed Latin American country. After a useless US Embassy official (Charles Napier) does nothing but refer him to a corrupt local attorney (a profusely sweaty Martin Balsam), Gaylor thinks all hope is lost. 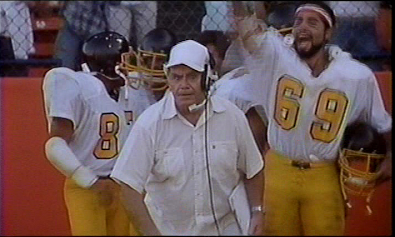 That is, until his gruff, fatherly coach (Ernest Borgnine) shows up with the team to draw up the perfect game plan. 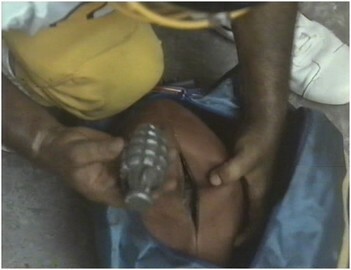 And Borgnine is a coach who really thinks outside the box: the team brought along their uniforms and equipment, along with props like a sliced-open football, into which their kicker stuffs a grenade and punts at a hovering chopper! Coach Borgnine and his special infrared binoculars are able to survey the prison and he directs his players where to fire and when to attack, which they do with enthusiastic grunts of "Hut! Hut! Hut!" as they crash through doors and walls, guns blazing, clad in full game-day attire. Why? Because it's the biggest game of their lives! 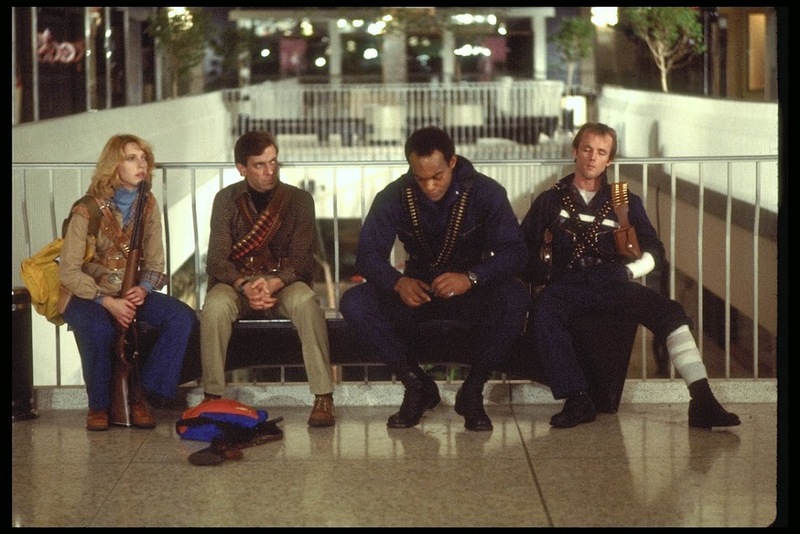 Evil, leering prison warden Henry Silva never stands a chance against this Hall of Shame team! The above clip, coupled with the one below, is essentially THE LAST MATCH in a nutshell. This second clip gives you more "Hut! Hut! Hut!" 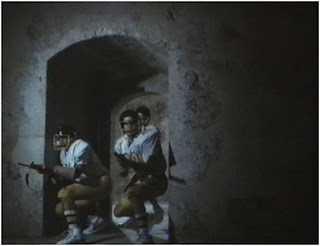 football commando action, Henry Silva overacting, Coach Ernie's infrared binoculars, staggeringly bad music, a sleepy Tobias, and even an inside-the-helmet POV shot. THE LAST MATCH probably sounds a lot more delirious than it plays. It's carelessly shot and lacks even the production values of cheap Italian action films of just a few years earlier, with much of the budget obviously going to aging, coasting vets like Borgnine, Balsam, and Silva. 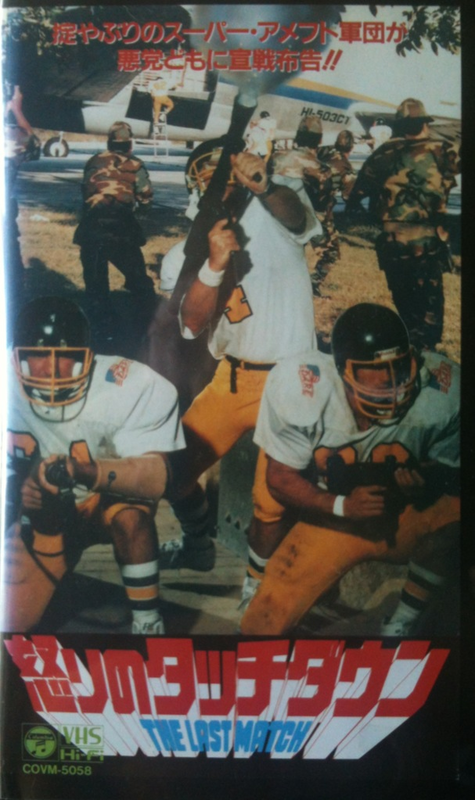 But once the football commandos suit up and raid Silva's prison, it becomes every bit the lunatic idiocy that the poster promises. 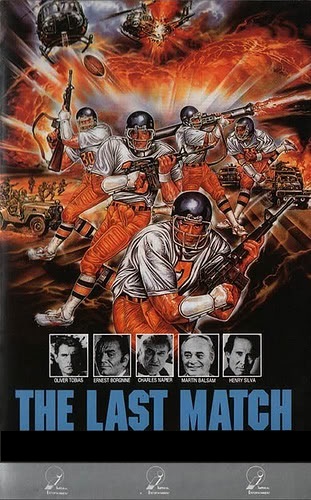 The film was shot in Florida, and adding to its insanity is that it also offers supporting roles for a few off-season or retired football players with Florida ties as members of Coach Ernie's football commando unit: former Florida State star and then-Buffalo Bills QB Jim Kelly (early in the Bills' 1989-93 stretch of Super Bowl futility, for which THE LAST MATCH must at least be partially accountable) and all-purpose Miami Dolphin Jim "Crash" Jensen are clearly visible, along with some retired Dolphins like tailback Mike Kozlowsky, receiver Elmer Bailey and Jim Kiick, a RB with the legendary undefeated 1972 team. Former Miami Hurricanes RB Mark Rush and Bart Schuchts, a Florida State standout and then-linebacker for the Arena League's Denver Dynamite, also appear. Has Jim Kelly ever fessed up to being in this thing? There's no mention of it on his Wikipedia page or his web site. Why is he in this? How did this happen? Did he have nothing better to do in his offseason? Kelly was at the height of his career in 1990--it's amazing that he wasn't used to sell this in the US. I wonder why they didn't just go ahead and make this an outright comedy. It's actually played totally serious, though Borgnine seems to be at least partially amused. Silva doesn't do much but smirk at Tobias, leer at Palmisano and yell at his guards, while Napier and Balsam aren't even in it enough to register. Tobias, who previously played for Coach Fabrizio on the much better COBRA MISSION (aka OPERATION NAM), is terrible, trying to be all grim and pissed-off but looking more like he took a sedative that's just starting to kick in. Packed with establishing and filler shots that take entirely too much screen time (not to mention a completely anti-climactic ten-minute coda that just proves De Angelis has no idea how to piece together a convincing-looking football game), clumsy shots of the unnamed Latin American country that happens to have Florida highway signs, an utterly terrible score, slumming name actors (including two Oscar winners in Borgnine and Balsam), a woefully weak lead performance, and arguably the most ridiculous premise in all of 1980s (for all practical purposes) Italian B-movie action, THE LAST MATCH is a total fumble, but a must-see for all bad-movie aficionados. Great review! Oh, sorry... that was a straight shot through the uprights! Both Imperial and Vidmark released a lot of crap in various Euro territories. Imperial Video was actually just as big in the UK as they were here, where they released LAST MATCH on VHS. No, sorry, that wasn't very clear, it was late when I wrote that. You said "neither ended up actually releasing it". Imperial Video did release it in the UK. It was widely released throughout Europe and Asia, but never here (perhaps due to the fact that this is the only place that would notice that de Angelis knows nothing about football). Nice write-up! Wish this movie wasn't so slow for the most part. Loved the final act though.